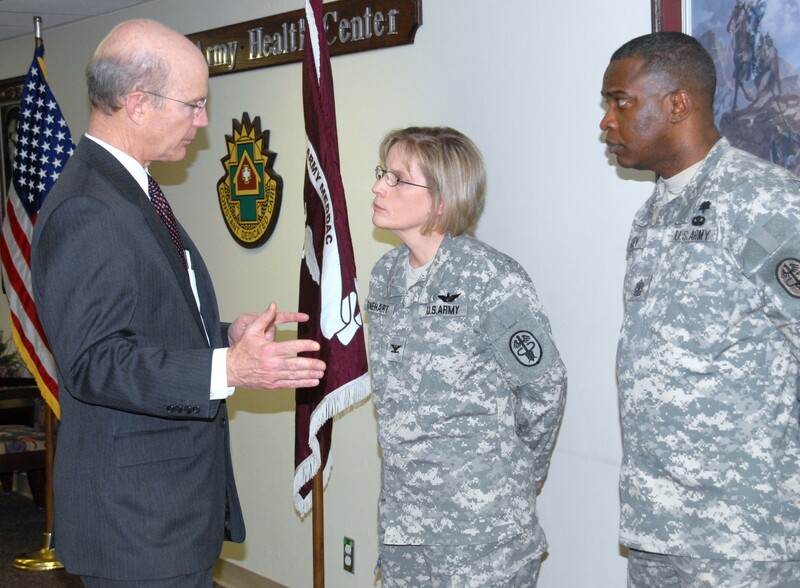 WASHINGTON (Feb. 08, 2008) -- The Army Medical Command has done much since the Army was shaken by revelations that Soldiers weren't getting the best treatment possible at Walter Reed Army Medical Center. "After the problems surfaced at Walter Reed last year, we took a hard look at how we handled what we called medical holdover," said Secretary of the Army Pete Geren. "We learned it wasn't well structured and it wasn't well supervised. We saw the population, because of the war, increase dramatically. And we hadn't increased the staffing to accommodate the additional demand on the service." Secretary of the Army Pete Geren met Feb. 6 with Col. Carmen Rinehart, director of Munson Army Health Center at Fort Leavenworth, Kan. and Sgt. Maj. Maurice Riley. During his visit Geren also visited with Soldiers assigned to the Warrior Transition Unit at Fort Leavenworth. The secretary said the Army's response to what was revealed at Walter Reed was swift, because, he said, it is part of Army culture for Soldiers to take care of each other. "I think if you look at what the Army Medical Command has done in the last few months, we have a lot to be proud of," he said. "Soldiers take care of Soldiers. When our Soldiers learned there were some that hadn't done that, it was like a shock through the system. Soldiers stepped up and moved heaven and earth to build a new system -- really from scratch." The Warrior Transition Unit is that new system. For wounded Soldiers, the WTU serves as a focal point for receiving the medical care they need to transition back into their Army unit or in to the Veteran Affairs health and benefits system as a civilian. There are 35 WTUs across the Army now serving nearly 9,000 wounded Soldiers. The secretary said Soldiers assigned to the WTU at Fort Leavenworth, Kan., told him they were impressed with the care they receive at the unit. During a Feb. 6 visit to Munson Army Health Center at Fort Leavenworth, Secretary Geren talked with Soldiers assigned to the Warrior Transition Unit there. "The Soldiers I met with today felt very positive," he said. "They had some suggestions on things we could do to improve the system, but overwhelmingly they said the system has gotten better over this past year. They feel pretty good about the way things are going." One of those Soldiers is Spc. Ernest Kendall, a transportation specialist with the 1st Sustainment Brigade at Fort Riley, Kan. Kendall suffered from a heart problem while deployed to Kuwait with his unit in April 2008. After a medical evacuation to Germany, Kendall was moved to Walter Reed Army Medical Center in Washington, D.C. Later, he was moved back to Kansas and into the WTU at Fort Leavenworth. He says he has seen a range of care in Army medicine and is impressed with what he is experiencing at the Fort Leavenworth WTU. "I was at Walter Reed in the old medical hold for a while," he said. "They were in the process of the changeover then, so I got to see both sides. I saw the medical-hold unit then, and I get to see the new system -- the WTU -- as it is now. And I can say it is definitely a 100-percent improvement. This is the best thing the Army has come up with for a wounded Soldier." While assigned to the WTU, Kendall attends community college and continues to work for the Army. "I work over at the Gentry Medical Clinic because I do have medical skills on the civilian side, and they are letting me utilize those," he said. "The primary mission in this unit is to heal, and of course after you start to get better, your capacity goes up. So I can do a job now. But I'm not quite fit enough to go back with my unit, to go overseas. So they are letting me do what I can do, which is good." Sgt. 1st Class Tony Snook is a mess sergeant, but during a deployment to Kuwait, he served as a future operations noncommissioned officer with the 377th Theater Support Command. "I went with the British liaison officer of Task Force Gator and accompanied him to Basra, Iraq," Snook said. "I was injured getting into a concrete bunker during a rocket attack on the British contingency operating base there. I injured my back and my neck." Snook, who has served in the Army since 1978, is now assigned to the WTU at Fort Leavenworth while the Army helps him recover from his injuries. He said he knows what the Army is offering him now in the way recovery care differs greatly from what his acquaintances would have experienced when he enlisted. "In 1978 I was a young kid, and most of the guys in the unit I went in had been in Vietnam," he said. "Some had been in World War II and were still around, and the Korean war too. We had a number of Korean war veterans. I know they didn't get the treatment anywhere close to what we are getting today, I can honestly say." "The treatment I got there -- I was on a waiting list for like four months," he said. "It was new procedure, a CAT scan or MRI -- we'd never heard of it. But I had to wait months to have them look at my cracked hip." Now he says, the Army has stepped up and is taking better care of wounded Soldiers, and he let Secretary Geren know. "They are taking very good care of us here," Snook told the secretary about the WTU. "I have no complaints." Secretary Geren said he is not surprised that Soldiers assigned to the Fort Leavenworth WTU are happy with the care they are getting. "This is an excellent facility," he said. "And the people here take great pride in what they do. The Army core value is to never leave a fallen comrade. That isn't just words on the wall, it is in the DNA of the Army -- Soldiers step up to take care of Soldiers." Secretary Geren also said the Army is expanding services and seeking additional mental health professionals to stem the tide of suicides among Soldiers. "Suicides have gone up every year," he said. "And last year was the highest level we have had since we have been keeping track in 1980. As an Army we have been working hard to address this, by expanding mental health services and trying to add additional personnel and additional training for the Soldiers, those in the chain of command, chaplains and mental health professionals." The secretary said the Army is facing challenges in fighting the rise of suicides in the service. Those challenges include getting rid of the stigma Soldiers associate with seeking mental health services and the lack of availability of mental health professionals. "When a Soldier is having a problem, a mental problem or an emotional problem, they (must) feel comfortable coming forward to get help," he said. "We do have a program called Army One Source where a Soldier can get confidential help. It's not as good as person-to-person, but it is a way to provide counseling through a confidential setting. We are working awfully hard -- but we are not satisfied with where we are today."